When you think about the Philippines what is the first thing that comes to your mind? Would it be crazy traffic, diverse ethnicity, or picturesque beaches? Whatever it might be, Philippines will still be the same country located in South East Asia with people that can sometimes be confused with being either Asian or Pacific Islanders. With that being said, recently the Philippines have been one of the countries that have been leading in commercial and infrastructure development in the region. In terms of cryptocurrency, the government has not yet officially said anything about the crypto market and the country still remains one of those who don’t accept it openly. But despite the fact, people are still educated and Filipinos now are part of the ongoing crypto movement that is happening around the world. This led us to the website www.buybitcoin.ph which we will be discussing today. The Philippines is not just a country with amazing beaches but a busy world where cryptocurrency is welcomed (by the people) and has an active trade market. We will be exploring the website Buybitcoin.ph, know about its features, how to create an account, and what are they made of in general. Without further delay, let’s talk about that! The website Buybitcoin.ph is registered under SCI Ventures, Inc. SCI which is short for Satoshi Citadel Industries is a company geared towards financial technology and has been building the Blockchain ecosystem in the Philippines. Butbitcoin.ph has been operating since 2015 and has offices in Metro Manila and Davao City, Philippines. Their main office is located at Unit 606 GC Corporate Plaza, 150 Legazpi Street, Legaspi Village, Makati City, Metro Manila, Philippines 1229. Providing an active email address is just the first part of the verification process. Just like any region-locked exchange websites out there today, getting a fully verified account can be a lot of work. This means that not only will you need to have an active email; you also need to have a local Philippine mobile number, valid ID, and an address to go with everything. The Know-Your-Customer or KYC level would greatly determine the tier of your account. The higher the tier the more perks you get like increased daily cash limit and daily cash out limit. As an unverified account holder, the stock account is at level zero. This means that you need to provide the required information to actually use their services. Basically, everything goes up the higher you get yourself up the account tiers. The requirements range from a mobile number, personal information, ID’s, address verification and source of income. Please be advised that the website is not regulated by local Philippine laws but they abide by AML Rules and practices of the financial industry. You can read more about their legal stands here. The website does not have that many features behind their façade. What we can say about their website is that it is properly designed and you will not have a hard time navigating your way through it. What we love about the website is that everything is where it is supposed to be. We looked around and found out that the website supports Two-Factor Authentication which is nice since an upgrade in security is always welcome when it comes to Exchange websites. They also have the “Connect to Facebook” feature wherein the user is able to connect a Facebook account and send/request funds to friends. 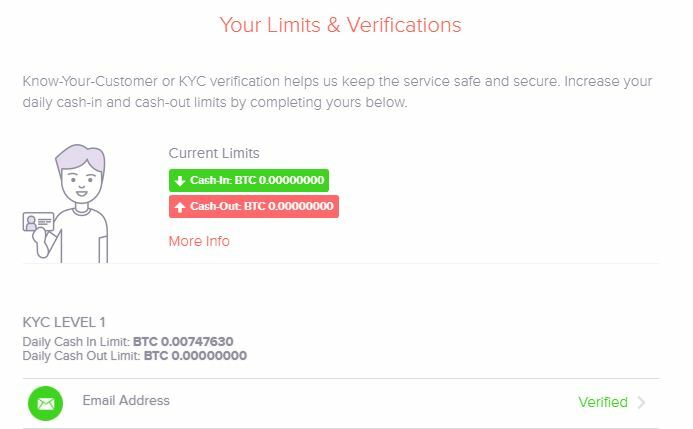 In order to transact with the website, the user needs to have a verified email address and have submitted a valid ID for verification purposes to buy/sell Bitcoins. Once a verified account has been activated, just head on to your account page and click on “BUY” which is located on the uppermost part of the account page. By clicking this tab, a separate page will pop up with the information needed to purchase BTC. The first step is to choose the payment method. Payment methods are all over the counter options with branches all over the Philippines. We’ve got Sterling Bank, RCBC, and Cebuana Lhuillier (a local money sending service company). 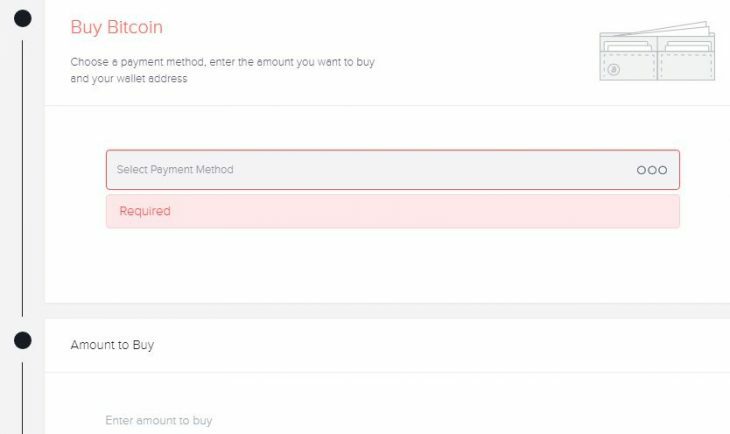 Every account tier has different payment limits, so make sure you have checked this before purchasing from the website. Selling of BTC is different since they have a lot of payout options to choose from. Most of these options are local banks such as Asia United Bank, BDO, BPI, PNB and international banks like Citibank, HSBC, and Malayan Bank. They also have local money sending services as a choice for payout, namely we’ve got LBC, M Lhuillier, Palawan Express, and RD Pawnshop. Just like any straight exchange websites, the fees are not shown nor even mentioned. This is because the fees are already within their buy and sell prices. This means that websites such as Buybitcoin.ph have a more overpriced stance of BTC compared to regular exchange websites today. 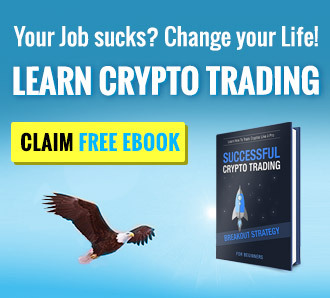 Since the website is a straight exchange, there are no deposit and withdrawals as everything is straight to buying and selling. This means that your money will not be stored in the website but instead, the transaction is much faster since the exchange of hands is a lot quicker than a regular exchange website wherein you have a wallet which you can deposit and withdraw funds from. When it comes to customer services, you guys know how picky we are when it comes to this topic. Buybitcoin.ph doesn’t have that much when it comes to customer service since they do not have a local number listed on their website. 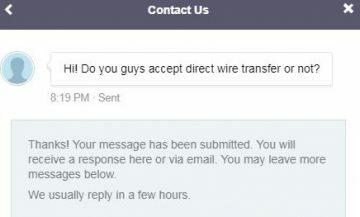 They do have a live chat support, which promises a reply “within a few hours” -this is a huge disappointment. Why would we wait a few hours to get a resolution to our issue? Since they do not have a phone number, we’re stuck with the issue until someone picks it up and hope to resolve it. Overall, we’re not happy with the live chat option. They do have social media accounts on Facebook, Twitter, Linkedin, and Instagram if this helps. Overall, the experience was not that great nor was it dull. We had mixed emotions since we were unable to use a completely verified account to explore their services. Good thing that even with an unverified account, we were still able to get a good idea of what perks a verified account will have. All-in-all, Buybitcoin.ph is not a bad website if you’re living in the Philippines!